We are Canadian, meaning we belong to a federation of Canadian Reformed Churches across Canada. We are Reformed, meaning that our historical and theological roots go back to the great Reformation of the early sixteenth century. In line with the Reformers, we acknowledge "Scripture alone" as the supreme authority in the church. We believe that salvation is "by grace alone" trusting in "Christ alone" as our Saviour. "To God alone be the glory" for saving us. We are a Church, an assembly of believers who treasure our bond with Jesus Christ and our bonds with each other as members of the body of Christ. 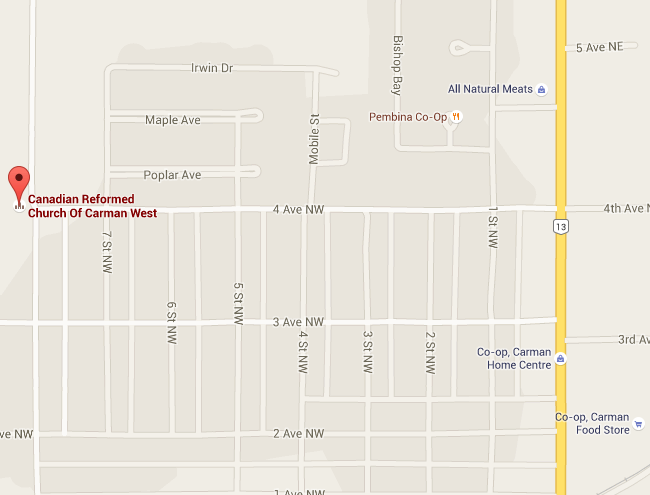 We are of Carman West, meaning we are one of two Reformed congregations located in Carman, MB. Our goal: Our goal is to let the light of the gospel shine in our lives and through us in the lives of others in our community and elsewhere. We therefore support and promote the proclamation of the gospel not only locally but also elsewhere in Manitoba and abroad.